You’ve most likely picked up this book because you’re intrigued with the nonphysical world and with learning more about developing your spiritual abilities, perhaps even the ability to see “beyond the veil” into the invisible. Vast dimensions of light and vibrant color, miraculous natural skyscapes and numberless beings of amazing beauty and grace await you. 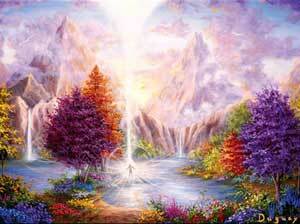 Glimpsing more of the world beyond the physical and the eternal realms with their angel choirs and cosmic beings has brought amazing blessings to mystics who have been chosen to receive a higher form of vision. Although not a seer in the typical sense, I’ve been gifted with an ability to perceive beyond what most of humanity has accepted as “reality” and thus am able to share insights with you that can uplift and support your spiritual journey of Self-discovery and union with your own perfect inner being. My hope is that this book will provide an impetus for greater progress and a rediscovery of the Divine within yourself and all of life. This is not a book that will explain ways of developing psychic powers to control the aura through intense mental or emotional processes or exercises. That’s not the real goal of spiritual progress. In fact, I most often see auras when I am not trying, when I’m simply “in presence,” when I am in a state of joy and serenity, feeling great love for and oneness with all life. Heaven provides this gift to me with the caveat that I use it to accentuate the good in all. Many true seers observe both the bright and beautiful and the dark and less radiant. It takes a conscious choice to behold the real within others and to then draw it from within them with kind and compassionate communications, with loving and considerate words. By developing your aura and inner sight, you can expand the good within yourself and others as well as protect yourself from unseen negative influences and forces. As you learn the techniques I’ll share in this book to seal and expand your aura, you will be able to safeguard loved ones, those entrusted to your care, your assets and even your very life.